About a year ago, I started to become really interested in Feng Shui. Our house was for sale, trying to accomplish a TON of work for school, and I just wanted an all around better “flow” to our living space. The more I read about staging homes to sell, and creating the best office space for productivity, the more I saw that everything seemed to align with the basic Feng Shui principles. And whether or not you believe in Bagua Maps or Yin & Yang, the basics of Feng Shui can help make any space feel more balanced, comfortable, organized, and vibrant! I mean really, what more could we ask for?! Now, let me also say that Feng Shui is a super in-depth practice and that I am certainly no expert (yet!) but this is kind of like the Kindergarten-level of Feng Shui rules. 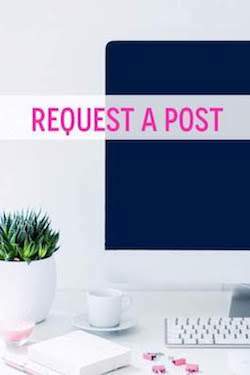 If you find it super intriguing like I do, I would suggest checking out this blog because it is always full of the best tips ever! Okay, here we go! Choose an air-purifying plant, such as a fern, lily, palm, or any of the other plants from this list. Some other great choices? Bamboo or a cactus! Because they are easy to take care of and also represent good luck! Plus, you know, cacti are SO in right now! First, you could put a mirror above your desk that allows you to see the door (although, mirrors can also “reflect the bad energy” of others who come into your space. The second choice is to make your wall “disappear” by creating a vision board of things that inspire you. Totally your choice! 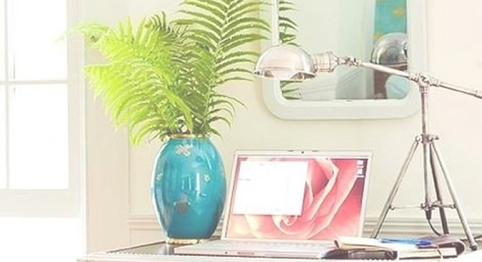 And even though it might be tempting to put your desk right in front of the window, it’s considered bad Feng Shui because it’s also tempting to LOOK OUT that window… and we’re trying to cut down on distractions! What would you have to do before starting work at this desk? Seriously. Open the computer and start, right?! That’s the goal! Deal with paper at least once a week in order to keep it from getting out of hand! Kind of in the same category as clearing out clutter, make sure to hide any power cords or other wires from plain sight because they’re distracting (and ugly). Use positive/uplifting artwork. Basically, everything around you influences you. This is why a lot of schools use the color blue in their hallways. Because it is considered a calming color. It’s also why Target uses the color red, which is linked to impulsive behavior (basket full of unnecessary items, anyone?). You want everything in your study space to be positive and encouraging to you and your goals! Do you have a small wind chime? Put it next to your window, those things always sound happy! Choose items with rounded corners rather than sharp edges. According to Feng Shui, sharp corners can cause us stress. Well, with a semester full of crazy work assignments and deadlines, we need to eliminate all the stress we possibly can, right? Rounded vases, candles, tables, etc. 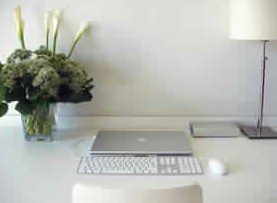 can be great additions to the “flow” of a workspace! A globe is also a nice thing to have in a study space! Try to incorporate all 5 Feng Shui elements (earth, fire, metal, water, wood) into your study space. This can be as simple as adding a jar of sand for “earth”, a small candle for “fire, a tin pencil holder for “metal”, a picture of an ocean or fish for water (or actual fish! ), and a wooden chair, shelf, or desk for the “wood” element! 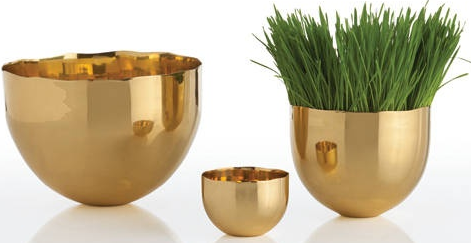 Keeping a somewhat equal amount of these items creates “balance” in your space! Use lots of light… preferably 3 different light sources! And yes, natural light definitely counts! Brighter spaces boost productivity and encourage us to keep our spaces cleaner! Also, it’s easier on your eyes! 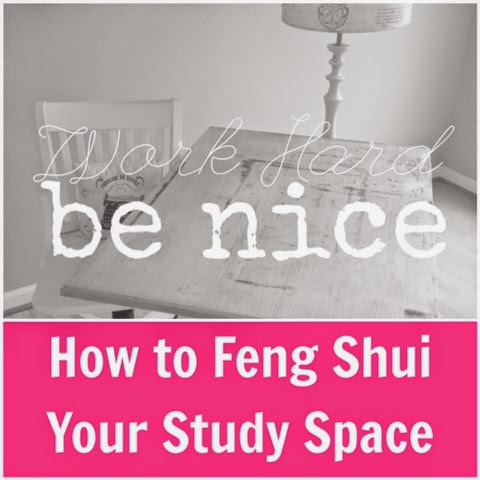 Like I said, these are just some of the most basic of all Feng Shui tips… there is SO, SO much information out there that you can really get as in-depth as you want to with it! I tried to help you out a little because each of these photos is linked to a different website about Feng Shui! Does your current work space follow any of these rules? Would you change it to try some out? If you have tried some of these tips, could you tell that they made a difference in your work? Why (or why not)?